Location: Coolidge Corner, meet at info kiosk at CC T-Stop. Volunteers are needed for a preliminary count of non-auto trips through Coolidge Corner for one or two hours – whatever you can do! We have 40 years of bicycle trip counts, but very limited pedestrian count data. These counts help us understand how and where people move in and through our commercial areas, which influences our infrastructure plans and helps our local businesses. We expect to repeat these counts at other times of year to provide on-going data. Please email kbrewton@brooklinema.gov ahead of time to volunteer! 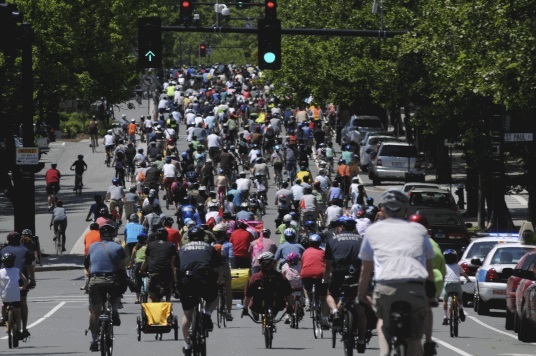 Join us for the 7th annual Brookline Bike Parade! Sunday, May 18th, 2014, at 12 noon. The parade will start promptly at 1 pm. Meet at Amory Park. Free bike safety checks begin at noon courtesy of Landry’s, Urban AdvenTours, East Coast Alpine and MyBike! It’s free! It’s fun! It’s friendly! It’s five miles! It’s a parade! This is a great excuse to pump up the old two-wheeler and have fun with hundreds of your bicycling buddies. If you register for the parade online, you can skip the registration on the day of the parade. Go to www.BroooklineBikes.org . Like us on Facebook. Tell your friends.